It was back to TCF Stadium for us last weekend as we attended the Minnesota Golden Gophers homecoming game against Big 10 opponent, the Illinois Fighting Illini. Not sure what an Illini is, but it sounds pretty intimidating. We didn't do any tailgating at this game so we didn't have a chance to connect with Avery before hand. He was kind enough to take a break from sitting in the student section to come over and say Hi to his parents. He didn't say too much more than Hi, but it was nice to see him for a couple of minutes in any case. Goldy Gopher must have been in the Halloween spirit or something because he kept coming out wearing different costumes. I've never seen a Gopher walk like an Egyptian before, but he had it down pretty good. The week before we were soaked while watching the game because of an ongoing storm, so we were nervous when we heard rain was also in the forecast today. We got pretty lucky, though. It was gloomy and cloudy, but the water pretty much stayed in the sky and didn't really drop on us too much. There was a huge BandPile at half time which was pretty cool. I'd have to think it's hard to keep playing music when you're jumping on to your fellow band-mates. The Gophers had not had much luck against Big 10 opponents so far this year, but they gave us a good performance and ended up winning the game 24-17. Which was nice. After the game, we rushed back to Prior Lake to go to a pizza party hosted by our friends, the Brown Family. Troy built a really fancy pizza oven and enjoys using it to cook delicious pizzas for his friends. We really like to be invited to these parties, because that's some really good pizza! Plus we always enjoy the company when we're hanging out with the Browns and Zitewitzes. They're a bunch of fun people. And I did I mention delicious pizza? There were a bunch of them! Even one with shrimp on it which I can't say I've ever had on a pizza before. So good. The only sad part of the evening was watching the Browns Dog, Chunk. Apparently he's not supposed to drink alcohol, but you can just see it in his eyes that it's hard for him to fight the temptation. We also had a chance to get together with our friends, Jeff and Cathy. Which was nice. We went to Old Chicago for pizza, which I'm starting to notice may be a common theme in our lives. 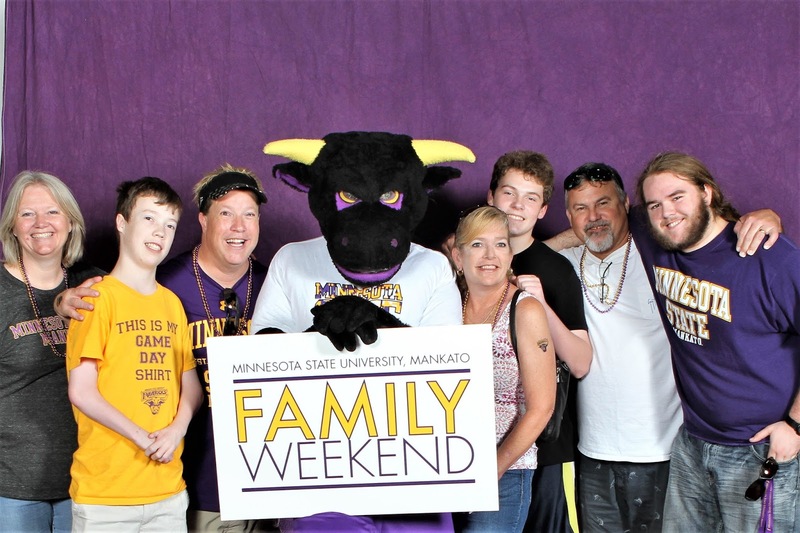 We went to Mankato Family weekend to see Luke and his roommate, Jackson, a couple of weeks ago. We just received this picture from the official Mankato photographer which I thought was cool so I'm sharing it now.